Today, let's talk crepes! I've made regular ones but this time, we're having chocolate crepes. In general, I think the idea of making crepes sounds difficult because we envision special crepe pans and wooden spreaders, and think about techniques we need in order to make these wafer-thin pancakes. In reality, crepes are not very hard to make, without special tools, when we're talking about homemade ones that don't need to be perfect. I think the notion of making chocolate crepes for Valentine's Day has gone through my head at least a couple of times in the past but it's happening now, in the very throws of summer, because I always tend to think of crepes with ice cream. I spend a good chunk of the summer daydreaming about ice cream. For this chocolate version, the chocolate comes from some 70% dark chocolate. For a deeper color to drive the chocolate theme home, I added a tablespoon of Dutch-process cocoa. And when it comes to ensuring easy crepe-making, I think the key is to strain the batter and to let it rest a good half hour to an hour before cooking. Do that and the crepes should be easy to flip, as these were. Each crepe cooks up quickly and what I like is you can make them, stack them, and then store them in the fridge for a few days (or even freeze them for a longer period of time). I simply warm them up in a warm skillet and I can pull together a "fancy" little dessert in a few moments. I'll be frank...I thought these crepes were a bit bland on their own but I suppose that's alright since crepes are meant to go along with fillings, whether it be chocolate or fruit or any sort of delicious combination you can come up with. Once the crepes come together with your fillings or accompaniments, something magical appears on the plate. Since I had ice cream in mind, that's the road I took with this batch. Each crepe I served up came with a scoop or two of vanilla ice cream, chocolate sauce, and sometimes, a bit of strawberries and cream on the side. My fellas were more than happy to dig into their crepes for a few days in a row! I don't think I fully appreciated how much my husband enjoys eating crepes but this cemented it. He was so happy digging into these and seeing that, and hearing his appreciation, is such a nice feeling. This crepe batter will make about 8-10 crepes using a 10-inch nonstick skillet. I use a little less than 1/4 cup of batter for each. For insurance, I very lightly oil the nonstick skillet and run it over with a paper towel so I have a thin, evenly distributed, coating. You might want to grease the pan this way for every 2-3 crepes you make. For the chocolate part of this recipe, use 1 1/2 ounces of 70% dark chocolate. Since dark chocolate is notoriously difficult to melt thoroughly, it's a good idea to heat it gently in the milk and give it some time to slowly melt as completely as possible. Be sure to strain the crepe batter through a fine-mesh sieve and to let the batter rest for at least half an hour for the dry ingredients to absorb the liquids. Since you're looking for the consistency of light cream, take a look at the batter after the resting period and add a little more milk to loosen it up, if necessary. I added an additional 2-3 tablespoons of milk to mine. When cooking, I used a 1/4 cup measure, nearly full, and drop it into the center of the pan. Immediately, swirl all around to distribute the batter around to the edges of the pan. The crepes cook up quickly. It begins to bubble up in spots and the edges begin to set. Use a small offset spatula to gently run it under the edges. Then, lift it up carefully with your fingers. You can also use a rubber spatula to help you along, lying the crepe over it as you continue to lift and then flip it over. Cook the second side for just a moment to set. My crepes are neither perfectly round or perfect at all but that's okay. I think it's better to just focus on what delicious toppings or fillings you'd like with your chocolate crepes. I can almost guarantee you there won't be any complaints! If you're serving your chocolate crepes with ice cream, I recommend folding the crepes up into triangle and setting the ice cream scoops on top. Filling the inside of a crepe with ice cream - burrito style - is a bit hard to eat in this case. I hope you are having a great summer and loading up on plenty of ice cream! In a bowl, whisk the flour, cocoa powder, and salt together to combine. 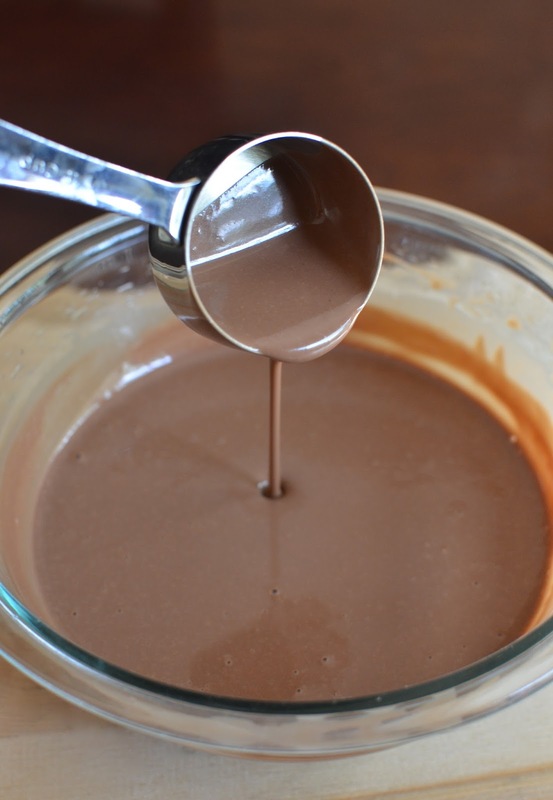 Place milk, chocolate and butter in a small saucepan over medium-heat. Cook, gently whisking occasionally, until chocolate is melted (as thoroughly as possible). In a large mixing bowl, whisk the eggs together with the sugar. Add vanilla extract, then the dry ingredients. Slowly beat in the hot milk-chocolate mixture until incorporated. Strain batter through a fine-mesh sieve into a bowl. Let batter sit for at least half to one hour before cooking. To cook crepes, heat a 10-inch nonstick skillet over medium-low heat. Check the consistency of the batter, which should be similar to thin cream. Add milk (may take a few tablespoons) to thin it out, if necessary. To help make sure the crepes don't stick to the pan, very lightly grease the pan with a neutral-flavored oil or cooking spray, swiping over it with a paper towel. Pick up the heated skillet and pour 3-4 tablespoons of batter (use a nearly full 1/4 cup measuring cup to do this) into the middle of the pan, quickly swirling the pan to evenly distribute the batter around to the edges. Cook for about 1 minute, or until the edges crisp up. Use an offset or rubber spatula to loosen the edges and check if crepe is ready to flip. Lift the crepe gently with your fingers (you can set the crepe over a rubber spatula as you lift it to help you along), flip the crepe over, and cook for about 30 seconds on the second side until set. Transfer the crepe to a plate and continue with the rest of the batter, lightly greasing the pan every few crepes. To serve, heat both sides of a crepe in a dry skillet. If serving with ice cream, fold warm crepe twice to form a triangle, top with ice cream and chocolate sauce, and serve immediately. If you choose to add fillings (like, say, Nutella and banana slices), warm crepe in the pan, spread filing on one half of the circle, fold over and again to make a triangle. Heat through and serve warm. Unused crepes can be stacked, covered with plastic wrap, and refrigerated for about 3 days. You can also freeze leftover crepes, separated with sheets of wax paper and tightly wrapped, for about a month. Thank you! I added that bit of cocoa for the color : ) . We do eat with our eyes first! Crepes and Ice cream...BIG yes! I made a chocolate crepe cake recently (client work) and I thought the same thing. The crepes as such don't have much flavour...it's the fillings that make the difference. Hopefully i will get to share the photos in future. Your crepes look perfect and the last photo is giving me a serious craving! Your children are so used to good food and clearly have great taste! I also love dark chocolate, as you know...and having a crepe or two for lunch is such a lovely treat. Hope you get your kitchen back soon. It will be a glorious place for you to create your magic, Nami! They are so evenly thin and beautiful. Well done, Monica! You have crepe skills!! I have an electric crepe maker that I use to cheat when I make crepes.. :P Vanilla crepes are a love of my mine, but chocolate really is something special! Another elegant and mouthwatering dessert, Monica! Truly, your son is going to go off to college some day and be amazed to find out that everyone didn't grow up with chocolate crepes for dessert on a weeknight! Please tell him I say to give his mom an enormous hug for being so amazing! (Feel free to tell your husband to give his wife a similar hug of appreciation!) I haven't made crepes in a very long time. You are right, I have it in my head that it is complicated even if I know it really isn't. These chocolate crepes are just what I need for an upcoming casual dinner party! Make ahead is a HUGE bonus! Awww...don't know about that but thank you! I do get lots of thanks and hugs. That is a huge motivator, isn't it. : ) Crepes for dessert after a dinner party is sure to impress. Hi Monica, oh I love crepes, but have never thought to make a chocolate one. That last plate looks so delicious and elegant all at the same time. Thank you, Cheri! I love how casual yet a little "fancy" crepes manage to be. These are fantastic Monica! What a gorgeous dessert with the ice cream, whipped cream, chocolate drizzle and the fruit. Yummy and beautiful! I've never thought about making chocolate crepes - thank you so much! I love that you made chocolate crepes, they look perfect Monica! The color is so pretty from the mix of dark chocolate and you can never go wrong with a scoop of ice cream and whipped cream! Such a beautiful breakfast! I might not be able to justify one with ice cream for breakfast but how about Nutella and banana...or just fruit? That would totally work! Thanks, Kelly! So I still have yet to make crepes of any kind! Which is sad! haha I don't even know what's stopping me! I LOVE the sound of chocolate crepes ... especially with ice cream! I have NEVER had chocolate crepes before!! I need to try these soon! I haven't attempted homemade crepes yet. You inspired me! Ive made crepes in the past, but CHOCOLATE crepes? Oh man! Im going to have to try this! Worth a try, for sure. Thank you. Wow these crepes look so delicious! I can see me making these asap! Hope you do. Thank you. Same for me. Anything with chocolate cake, and anything with Nutella is always good! Oh my! Chocolate crepes with ice cream, a perfect dessert! There's nothing better than seeing the food you make enjoyed by the people you love! So glad your family loved these crepes. I would too! I feel that way for sure. Thank you, Beth. Yum! Love the thought of chocolate crepes, strawberries, and ice cream together. Straining is also a really good idea! Your crepes look perfect. Girl, you are tempting me to go make some. It's the fillings that make the crepe and yours looks delicious. I remember when we were in Paris, I lived on these and boy oh boy, I missed it so much when I got back. I remember gaining quite a lot of pounds too.;). We really like crepes! There is a Japanese crepe place around our area. We go there all the times. I haven't tried chocolate crepes before! Totally want to try them. Gorgeous presentation with the ice cream and strawberries. I can imagine you and your husband going to your local crepe restaurant...sounds wonderful!! : ) And it definitely is a fun thing to go out for and pick whatever you want for it. I may be going with my family to get some on Sunday! You are a woman after my own heart - I like to try and experiment adding chocolate and cocoa to recipes. To be honest, I have limited success and need to go back to the drawing board. These are a resounding success Monica, they look delicious!! Thanks for the tips for perfect crepes too. Very useful!! Hi Jo! Thank you! What's better than adding chocolate/cocoa to favorite recipes. ; ) I have to admit that sometimes, I find the original/plain version is better but it is still fun to try. And it's never "bad" when chocolate is involved anyway. Glad you find this helpful. Hope you are having a great summer with your family!